Is it impossible to find vegan food in Japan? Are you going to starve? Or will need to push aside your convictions and eat something you wouldn’t usually eat because you think you’d have no choice? Japan is famously known for sushi, ramen, yakisoba and other dishes where fish and pork are often the stars of the meal. I’m not gonna lie, Japan is not one of the easiest countries to find vegan food. But, don’t be discouraged by this! I had the opportunity to stay in Japan for 10 days and I knew it was not going to be easy, but all the planning beforehand helped me a lot and I ate like never before. Ramen 100% Vegan I learned to do in Osaka. While it’s true that it can be a somewhat complicated destination, with this guide I want to show you some things you should take into consideration if you want to visit Japan as a vegan. Japanese food is an art, there is a lot of attention to the details, the quality of the ingredients and the flavors. Food is integrated in a balanced way where everything is complemented in a harmony of colors, textures, and flavors. As Japan is an island, the sea products are very well marked in Japanese cuisine and it’s very common to have fish-based broth (fish dashi) added to almost everything. From miso soup to sautéed vegetables- that at first glance seemed perfectly safe– they most likely contain dashi. It is so popular that you can find it in soups, noodles, sauces, processed foods, stuffed rice balls (onigiri) or even the rice used for sushi can contain dashi. There is a kind of dashi which is suitable for vegetarians and it’s made out of kombu algae and/or mushrooms, you can check with the cook if they have that type of dashi available. Other ingredients derived from milk or eggs are also added to different foods that sometimes do not make any logic to contain them. But don’t be frightened! 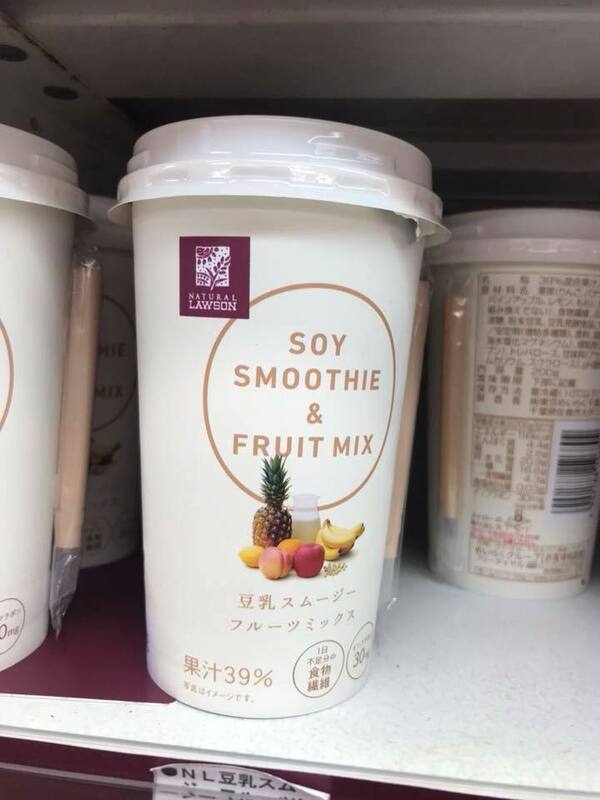 Although Japan could be a bit tricky for vegans, there are always some ingredients or products that you can count on. 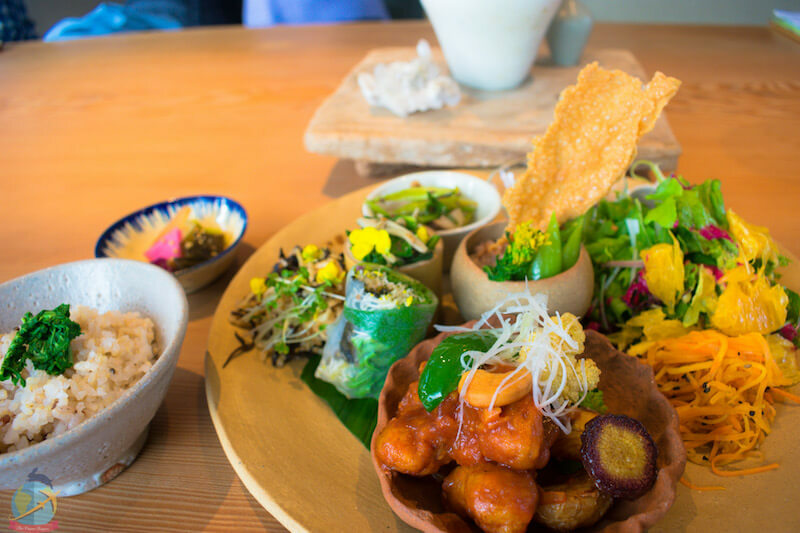 Macrobiotic food is popular and you can find it in various parts of Japan, they often follow holistic and Ying Yang principles on the cooking process. Although this type of diet is not 100% vegan, it’s, however, a good option sometimes as they use as many whole foods as possible, including a variety of vegetables, legumes, soy products, and whole grains. If you find a place that offers macrobiotic food check if they have any vegan-friendly dishes. I’ll never get tired of saying it. Research, research, research! I may be a control freak control in reading and investigating, but it has helped me a lot. There is a lot of information on Pinterest, YouTube, and blogs on how to be vegan in Japan. I particularly find one of the most helpful things is to join local vegan groups on Facebook. But don’t ask right away the same question that maybe hundreds of other people have asked as well! There is a high chance that it’s been answered before, so I suggest looking within the group first and try to find the information you are looking for. Chances are it’s already there. Perhaps in Japan, it is a bit difficult to find certain things, or they may be super expensive. In my case, as sometimes I don’t have enough time to have a trip to the nearest supermarket to get supplies (for breakfast, especially) I bring a couple of things with me in the suitcase, like instant oats, for example. It’s a simple and quick thing to prepare for breakfast the next day if I was not able to do any shopping yet. 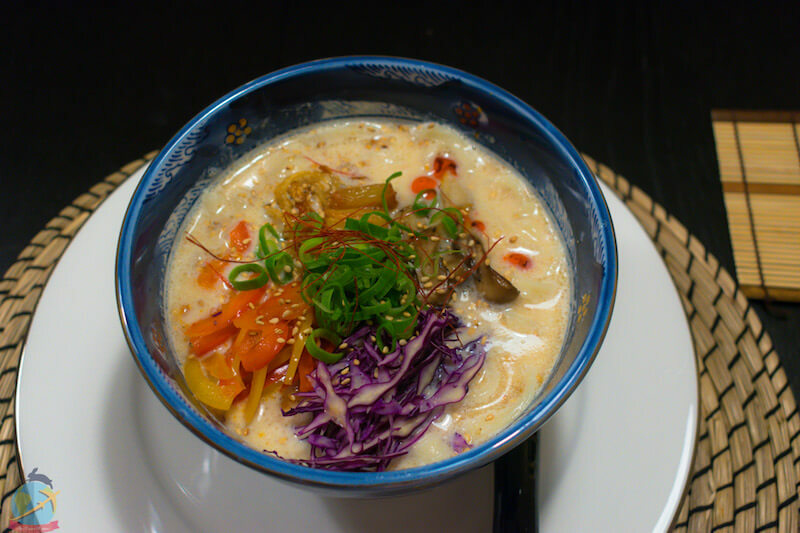 You must be aware of foods that can include hidden animal products, like miso soup, some sauces, and dressings, the tempura may contain eggs and if you find veggie ramen you have to check that the noodles are vegan unless they use the udon type which usually are. Of course, if you have the HappyCow app on your phone you’d be able to locate more easily if there are any restaurants around you that carry vegan options or way better if there are vegan restaurants nearby. If you don’t master the Japanese language, at least it’s important to become familiar with a few words. So if you go to the supermarket or a restaurant and there is no menu in English you may be able to identify some of the ingredients. 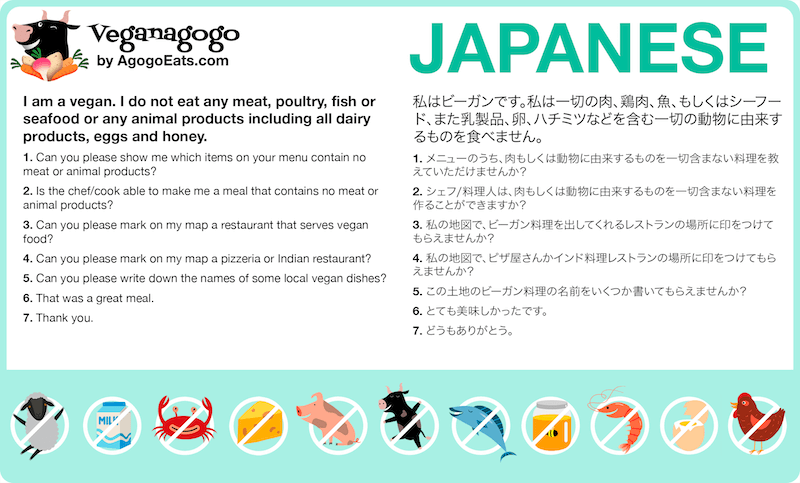 Before going you can print or save some vegan cards in Japanese, such as the one below from Veganagogo. I showed my card when I went to a non-vegan restaurant and the attendants barely spoke English. They checked the card and tried as best as possible to guide me on the options they could offer me. When I visited Nikko the restaurant lady indicated to me that the tempura they sold contained egg in the mix and offered me a salad instead. We could understand each other even though I do not speak Japanese and she didn’t speak English, all thanks to that card explaining everything. You can download an app on your cell like the ones I suggest in my post. In the big cities, I found it quite simple to always find a place to eat, especially near the tourist sites. However, in smaller cities or towns things become a little bit more scarce. 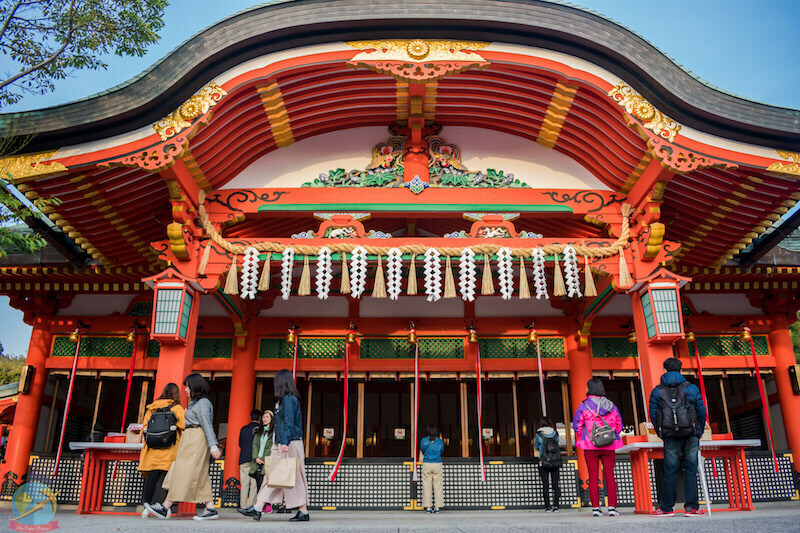 The positive thing is that Japan has a Buddhist majority, there are many temples throughout the country and there is the possibility that the monks practice vegetarianism. 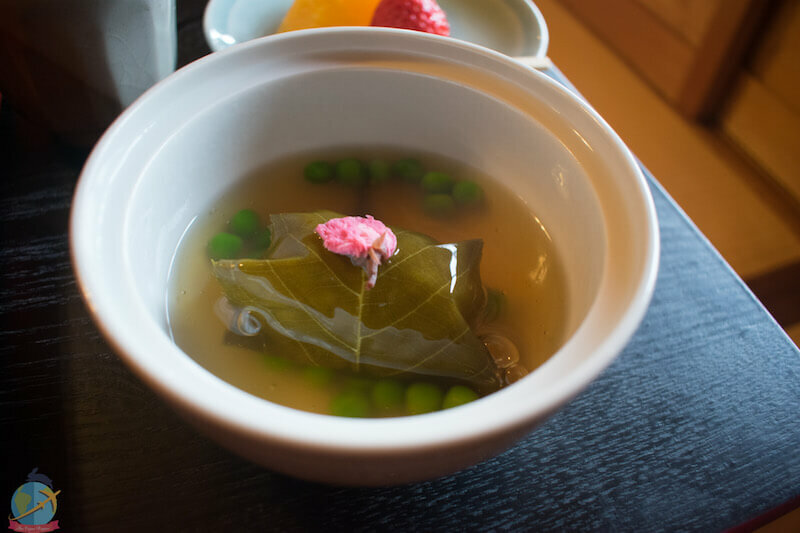 Shojin Ryori is the traditional Buddhist cuisine and is based on the concept of non-violence, is mostly vegan/vegetarian (some monks can use fish dashi). 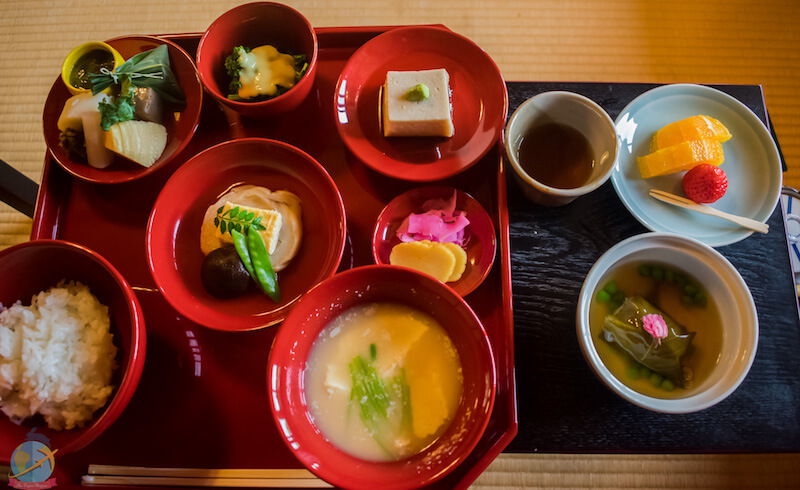 Several temples in Japan offer the opportunity to try this culinary experience consisting of a meal that includes several courses with a variety of main and side dishes. The monks use local ingredients and apply the same principle of the harmony of flavors, textures, and flavors. This kind of tasting of the Buddhist cuisine in the temples is not the cheapest, but I suggest to try it at least once as it is an experience that you definitely should not miss, especially since it is a very good alternative if you find yourself in a small town and there are not many options, maybe in some nearby temple you can find something promising! 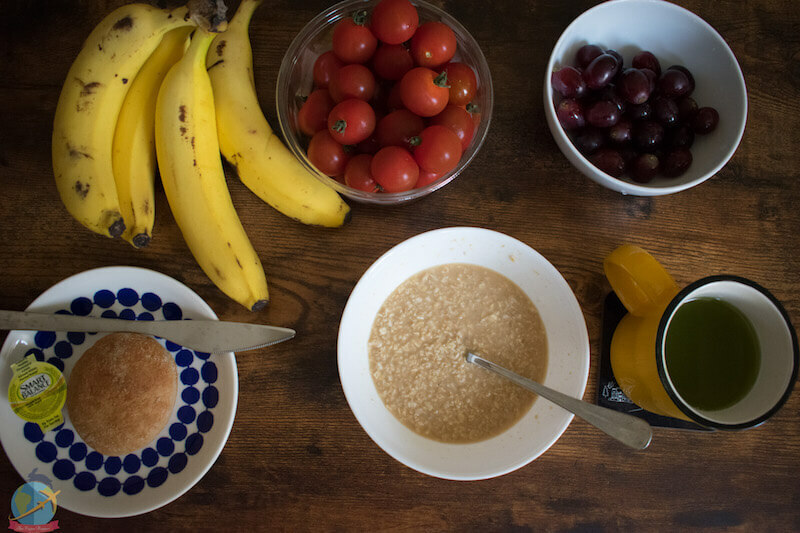 Are you used to eating cereal or toast for breakfast? But you haven’t been able to find vegan bread in Japan or some cereal? Then change your plans, improvise and evaluate the alternatives. You have to take into account that the idea of breakfast in Asia is very different to Latin America or Europe, for example, so if you go with an attitude that you want to eat the same things you always eat at home you may get a bit disappointed. In the same way, if you are looking to find Italian, Mexican or Lebanese food in a small town in Japan, your only options may be a sushi restaurant. It’s very important to be aware that the place where we are going is a totally different culture, also veganism is something that has not been explored or acknowledge enough. My advice is not to close the doors to try new things, even if not the type of food you are used to. If you want to prepare something you would really miss then it’s a good idea to bring some products with you that may be difficult to find there, but there is nothing more enriching than venturing into totally new things and taste different food styles and ingredients. My improvised breakfast in Japan: Instant oats I took from home, bread and vegan butter leftover from the flight, fruits I bought at the supermarket the day I arrived and matcha tea. 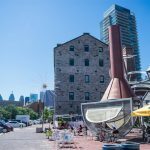 It’s not a bad idea to look for accommodations with a kitchen so you can prepare your own meals. Convenience stores or Konbinis are small shops that you can find almost, at every corner, they are super useful especially because the prices are good and are open 24 hours. The problem is that the supply of products that can be vegan is extremely scarce and finding something to eat can become quite complex. 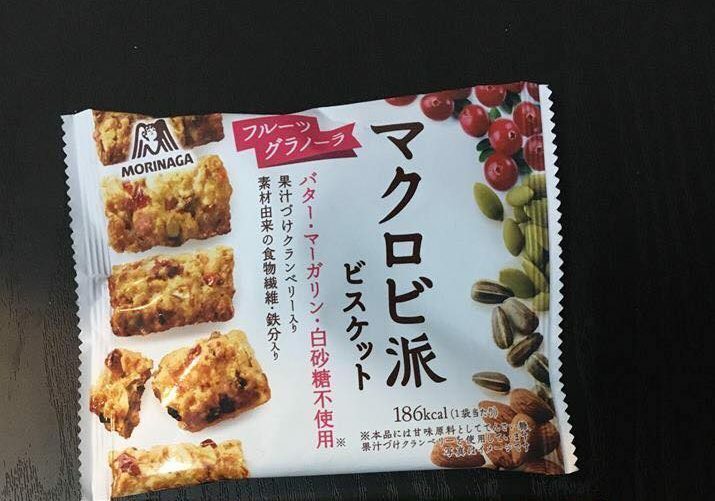 On the one hand, you have the language barrier with all the labeling is in Japanese; and on the other that in Japan many times, not all ingredients are detailed in the product! Exactly! For this reason, it is extremely difficult to rely on the processed products that are sold in convenience stores- or any store for that matter- because even if at first glance everything seems fine it may contain something that is not even vegetarian. 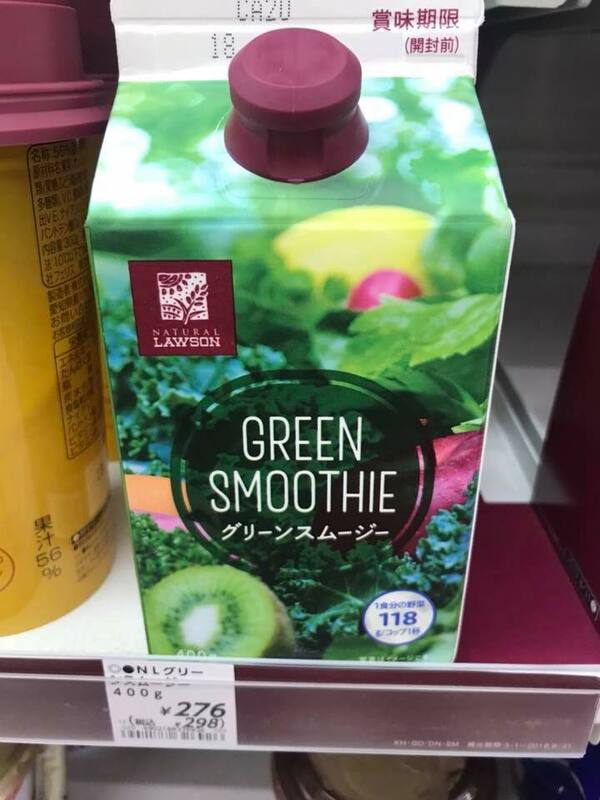 To make your life easier in Japan, I suggest to better stick to products that are not so processed, except for a few that have already been confirmed as suitable for vegans. 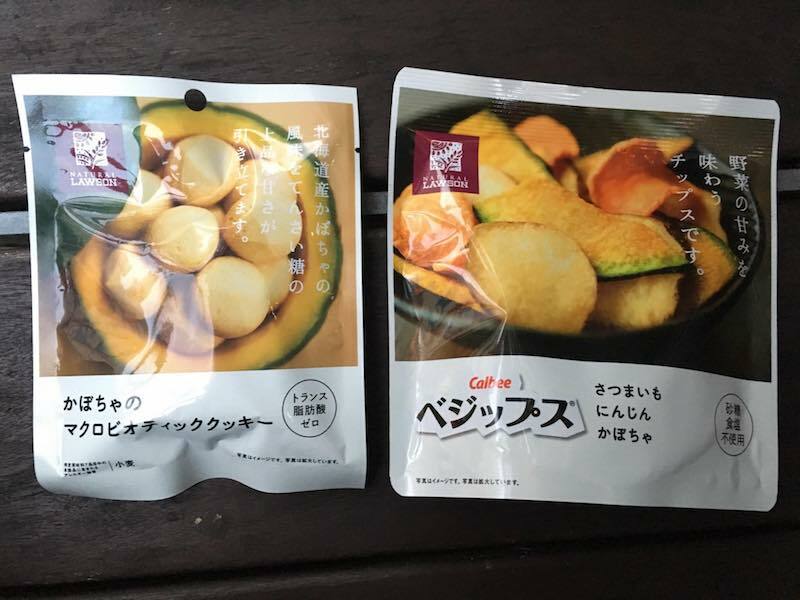 The Facebook group of Vegans in Japan have compiled some snacks that can be found in different convenience stores and are suitable for vegans, here I show you some. 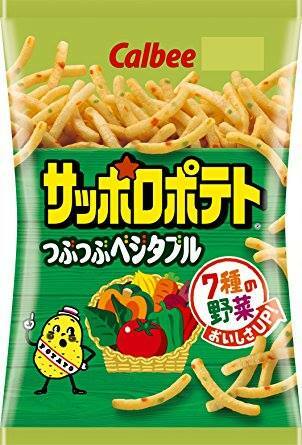 Vegetable snacks of the brand Calbee. A visit to the supermarket is also a good idea, you will have many more options and it’s easy to find local and essential ingredients of the Japanese cuisine. Fruits like, pears, apples, persimmon, plums. In supermarkets, you can also find more variety of products such as bananas, strawberries, grapes, pineapple, watermelon, pasta, and even ingredients for Mexican food, cereals for breakfast, lentils, beans etc. Use the Google Translate app to translate images and have a clearer idea of the ingredients (it’s not perfect, but it helps). But as I mentioned above, do not rely too much on the processed products especially if they appear to have been marinated or seasoned. The prices? A little more expensive than buying a banana in Latin America, but not bad considering that you are in Japan. It is possible to find certain vegan substitutes such as almond milk, dairy-free cheese, mayonnaise, etc., in some specialty shops or large supermarket chains. A type of bread that can be a good option is the baguette type. In bakeries or organic/natural products stores it’s also possible to find bread and other baked good suitable for vegans. WHAT TO EAT IN JAPAN IF YOU ARE THE ONLY VEGAN IN THE GROUP? If you go to Japan alone or with other vegans you can decide where to eat, and if you want to go exclusively to vegan restaurants there will be no problem. But traveling with other people, especially if they are not vegan, may involve having to compromise certain things. It is possible that your companions don’t really want to try any vegan food with you and that your only choice is to visit places with very few options and not the vegan restaurants that you really wanted to visit. If you find yourself in the situation that they go to very Japanese places where the vegan food is pretty much absent it may be possible to set up a menu with certain things, although it will be something very simple it can help you to calm the hunger until you can have time to visit another place even if it is on your own. In restaurants/bars type izakaya you can find rice, edamame, salads (without dressing because it’s probably not vegan), some type of tofu (check that it doesn’t come with some sauce or fish flakes) and, fries. In sushi restaurants, it’s also possible to find some rolls suitable for vegans such as stuffed cucumbers, natto or pickles. 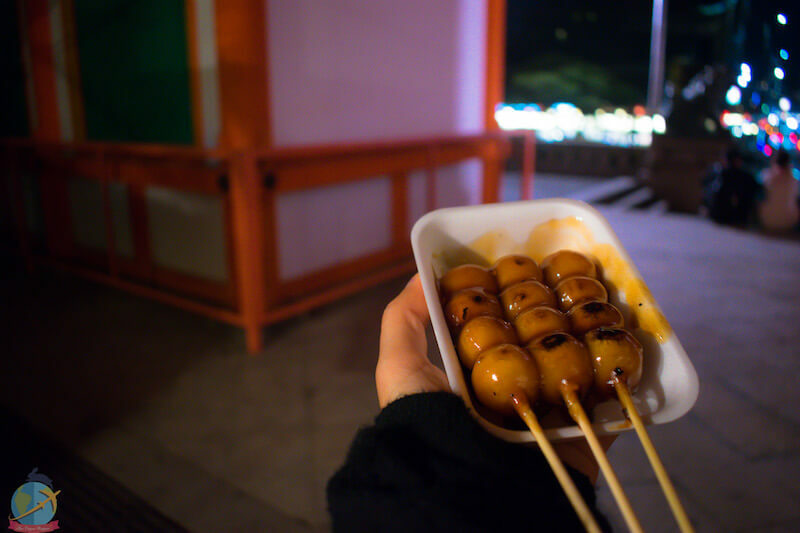 About street food, you can find roasted sweet potatoes, roasted chestnuts, grilled rice balls or mochi and Mitarashi Dango (traditional rice-based balls with a sweet soy sauce glaze). For all these cases always check with the seller to confirm that they are not using dashi, honey, egg whites, etc. The Mitarashi Dango is a Japanese dessert composed of rice flour balls that are roasted in a grill and covered with a sweet soy sauce glaze. The sauce is usually made of soy sauce, sugar, mirin, water, and cornstarch or potato starch. At Starbucks they have soy milk available and everything is prepared separately. 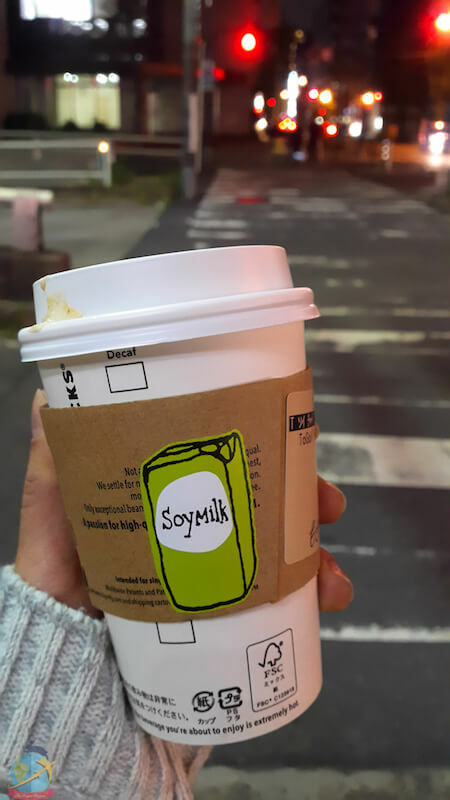 Here I enjoyed a delicious Chai latte on a rainy night in Osaka. I recommend that you talk with your travel buddies before the trip and come to some sort of agreement, whether they can accompany you to some vegan place or find options where everyone can eat comfortably. In case nobody wants to go with you to a vegan restaurant then why not to consider to go on your own? or why not try to make local vegan friends or some other vegan traveler who is in the same place as you?! Although we still cannot say that Japan is a paradise for vegans or compared it with cities like Berlin, Tel Aviv or Los Angeles, it’s true that veganism is a lifestyle that is taking impulse. Little by little, but it’s there and that’s what’s important. Traveling is about expanding our horizon, meeting new cultures and appreciating the world. If we do not put the food as the main goal we can have a good time despite the shortage in some places. I hope nothing stops you from visiting a place for fear that things can go wrong, there are always options, you can always improvise and adjust your priorities. In Japan, I could find many delicious things and to have an idea I show you everything I was able to eat in the previous post!